This is one of those great moments-in-time shots. 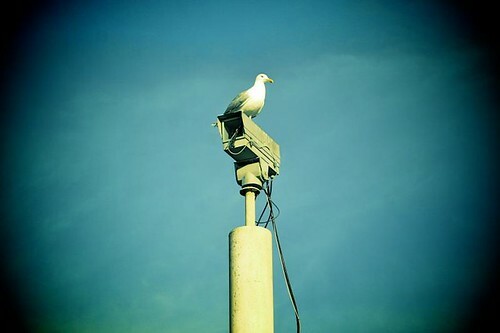 I turned round and notied a Seagull sat on a CCTV camera. They both appeared to be looking down at us. From the angle both the Seagull and camera seem quite powerful. I think most would agree the Seagull wins when it comes to who has the greatest view. I added a cross-processing effect to increase the gritty urban theme and a very heavy vignetting effect around the edges to make it feel as though we too were watching them. An almost telescope like appeal to it. As ever your thoughts and comments are welcome. Have your say.